For the ultimate Microsoft Vista experience, try the Verbatim USB Keyboard with Vista Keys. 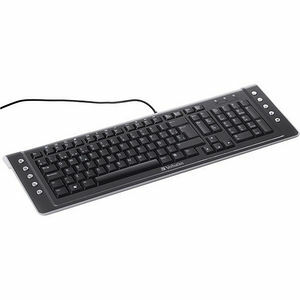 This keyboard features a media console that lets you play and navigate through your music files, along with internet browser controls for great web surfing. Low profile keys create a soft-touch typing experience that will help you glide through your work. And it offers Vista easy keys for direct access to the internet and Vista functions like Gadget, 3D Flip and Media Center. A must for any Vista user!